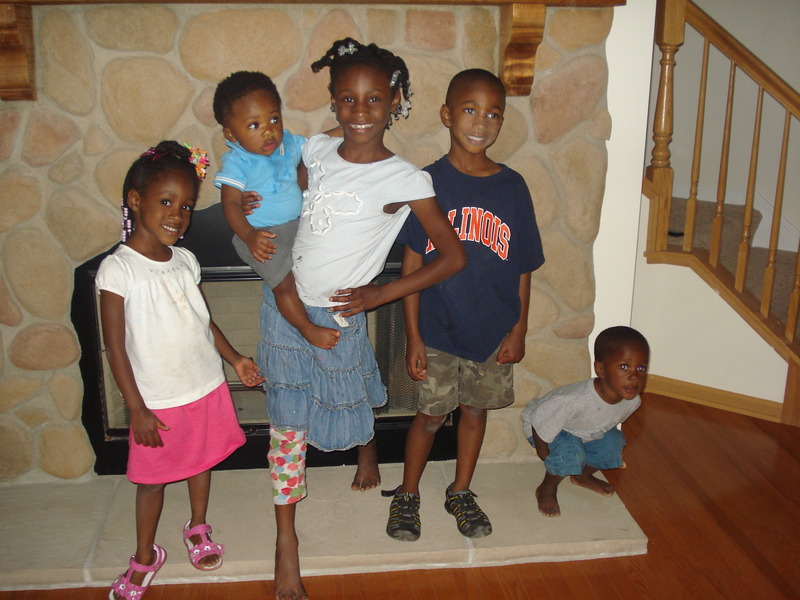 Note: I wrote this post in 2012 and God blessed us to have our 6th child a year after moving into our new home. He is so faithful! I have settled into my NEW NORMAL! The last few months have been quite an adventure and we are beginning to slow down FOR NOW. 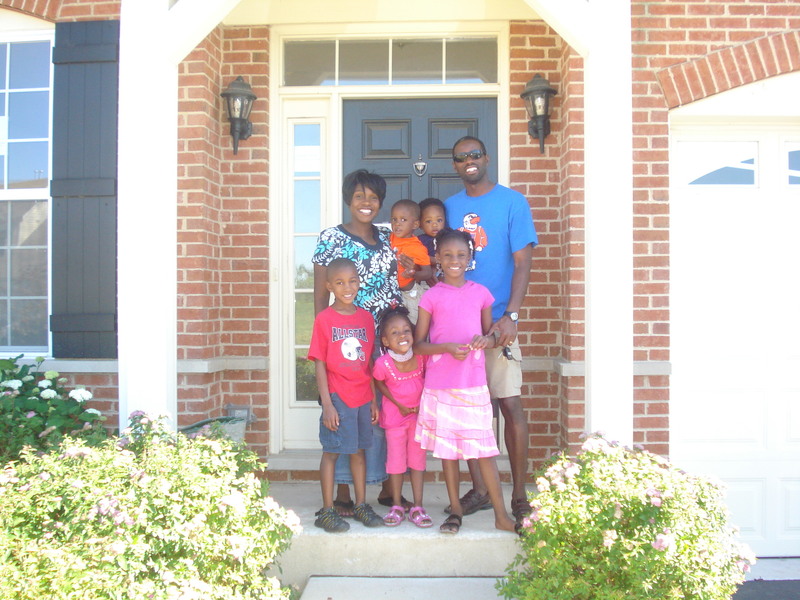 We were blessed to move into a bigger home to accommodate our large family. God moved in a supernatural way and opened a door that we could not open on our own. This post is to encourage you to stand in faith and to believe God for the impossible. This is not just about a bigger house but it is to put spotlight on a God that still honors faith and moves mountains. Put on your cyber listening ears and allow me to TESTIFY!!!!! When my husband and I first moved into our previous home 8 years ago, it was so big. It was just the two of us and we were expecting our first child. That was in 2003. But 2005 came and we welcomed our 2nd child, then wouldn’t you know it baby number 3 came in 2007. We had developed a pattern of having a baby on odd years and the trend continued. Baby number 4 came in 2009 and blessing number five came 2011. If you were exhausted reading that imagine what it was like for us. Needless to say, we outgrew our humble abode and desperately needed more space. But there was just one little problem. The finances were telling us that we COULD NOT afford to move. When we first moved in our home, it required a lot of TLC, so we took out a loan to do some home improvements. After we were done doing what we needed to do to make the home livable, we had incurred a large amount of debt. We were not required to pay back the loan until we moved out of the house and there was no interest. We did not anticipate having so many children so quickly and assumed that we would be in the house for quite a while. God however had another plan. My husband was the only one with an income. I have been a stay at home mom for the last 8 years, so we didn’t just happen to have an extra $28,000 hanging out in our savings to pay this debt so we could move. But we couldn’t deny that we needed more space. We petitioned the Lord and had other likeminded believers standing in faith with us. To make a very long story short the debt was FORGIVEN IN FULL! God seems to major in forgiveness of debt doesn’t He, remember the cross scenario? We received news that our $28,000 debt was forgiven in full the day that our fifth child came out of his first of three major surgeries. The news was a great source of encouragement for us during this season of great uncertainty. We were SUPER EXCITED! But we still did not have any extra money to move forward to purchase a new home that would accommodate our growing family! We continued to stand in faith and not focus on our bank account. We went looking at homes that we knew we couldn’t afford, all the while praying for yet another miracle. The house hunting process was a very long one and we had many moments of feeling discouraged but pressed forward in faith. There were many believers standing and believing with us. In the process of looking for a home, a dear sister at our church told us something that we initially did not have the faith for. She told us that she was believing the Lord to give us a house that was no less than 4000 sq. ft. and that our new mortgage would be the same or less than what we had been paying for our 1100 sq. ft. home. WHAT? That was just crazy. We did the smile and nod script when she first shared this impossible desire with us. But with time, we began to believe the Lord for just that. To add to the frustration of the house hunting process, no one seemed to be interested in our home that was now on the market. By divine intervention we had some teachers from our children’s school LITERALLY show up at our front door expressing interest in renting our home. We had previously dismissed the idea of renting because we did not want to deal with having people in our home that we did not know. BUT the Lord stepped in and sent these tenants to our front door. They were very serious about renting the property, so much so that they were willing to give us the security deposit months in advance. It was also an added bonus that they were not total strangers to us. We agreed to rent them the property but expressing to them that we still had not found a home to purchase. Right when we hit the point of fatigue, my husband came across a home on the internet in an area that we had not even thought about. The home was only 5 years old and had recently gone into foreclosure. When my husband saw it on the internet, it had been on the market for a few days. I must admit that when he first showed me the home online, I was not impressed and thought that it looked too good to be true. I assumed that there had to be a catch and they were lying about the measurements of the home considering the listing price. He called our realtor and had her schedule an appointment. RELUCTANTLY I went. I had my “I told you so” speech all ready for after we viewed the house and realized that it was a scam. But wouldn’t you know it, God blew our minds! The home was beautiful, perfect for our family. We made an offer that was lower than the already reasonable listing price. We were told that the bank would not entertain our price because the asking price was already so low. We figured God had brought us this far so why not! The bank did budge and fast forward to a few months later, I am now sitting in that same house on my computer typing my TESTIMONY! Yes that’s right, the home is now ours. Not only is it a beautiful home but it is 4103 sq. ft. and oh yeah our mortgage payment is $25 dollars cheaper than what we were paying for our 1100 sq. ft. home. GLORY!!!!!!!!!!!!! To give out of our lack, even when it just doesn’t make sense. God’s timing is certainly not ours but don’t give up if it doesn’t come when you desperately want it to or expect it. To Serve Him faithfully even when we don’t have what we WANT. Continue to walk in faith and not be concerned about appearing negligent and foolish in the eyes of others. 6. When the blessing comes, it may not be in the package you expect it but it’s just what you need. Look to Him and not man to be our provider. Praise Him in LITTLE and in PLENTY cause He is the same good God regardless of the season. Serve God and not the blessing! Striking a pose on closing day in our new home! 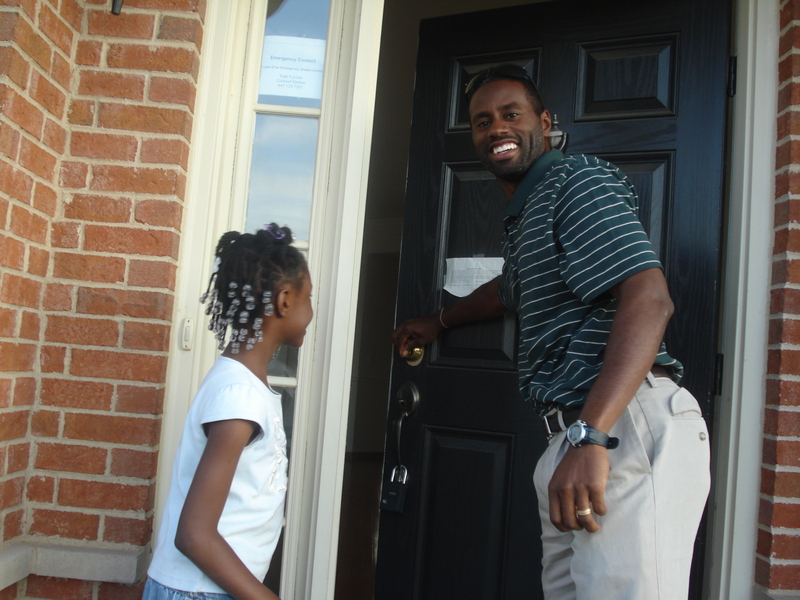 Tyrone opening the door of his new home as Naomi looks on with much joy and excitement! Delay is never Denial. You said it beautifully,”God’s timing is certainly not ours” We have to remember to keep praying that prevailing prayer and keep pressing forward in faith. 2013 is an odd year, let the trend continue…..
Amen I am encouraged by this testimony every time I hear it! Testimonies get better over time! I agree with you on that one. God is absolutely amazing, and it is so very helpful to rehearse our testimonies.